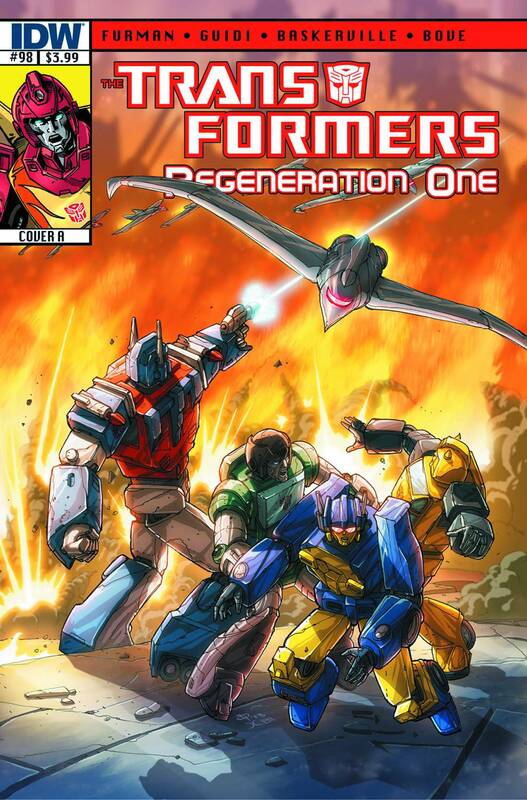 Here we are, at whatever the one before the penultimate issue is called, the last but two chapter of the original and founding Transformers saga. In other, less convoluted, words, here’s Transformers: Regeneration One #98 (of 100), which hits comic stores this coming Wednesday (January 29th). And boy, does this one kick some serious assets. We’ve been kind of teasing the threat posed by/true power of (former Cybertronian senator) Jhiaxus for a while now, but this issue should leave no one in any doubt about his lofty niche in the pantheon of Transformers villainy. But, before you read on, be warned, my authorly digressions do have a hint of spoiler about them, so if you’d rather have your issue served up unsullied by loose-lipped internet blather, cease reading now. Okay, so, where’d we leave things. Oh yeah, Rodimus Prime just got smacked around by Jhiaxus and he’s not taking it lying down. In fact, he’s mobilizing the whole dad-blasted Cybertronian fleet and going in all guns blazing. Not your average, agonize-about-it-for-a-decade Prime this one. Oh no. If this were toy branding, it’d be Affirmative Action Rodimus Prime emblazoned on the packaging. But is such all-guns-blazing action against a largely unquantified foe a wise move? Maybe not. Anyway, once the action kicks off it never stops, with the kind of full on epic battle the like of which this comic has never seen. “Could there possibly be room for anything else,” I hear you wonder. Well of course. There’s also the return to, um, unrestrained action for not one but TWO uber-fan favourites. Both of which you’ve been crying out for. But one of these is kind of good news, and one is very bad. Especially for poor Optimus Prime. Plus (oh yeah, it keeps on coming), the mystery of Galvatron and those Acolytes of Unicron takes another unexpected twist. Alrightyyy! No full IDW preview yet, but as soon as one surfaces I’ll update and link to it here. NOW UPDATED with link to preview. AND ON A HAPPIER NOTE, HERE’S 2014! Matt Hatter Chronicles: season 3 of the hit CiTV and NickToons animated show blasts onto (small) screens late summer/autumn 2014. As before, I’m deeply involved with the show on several levels, as lead writer, story supervisor and script doctor (where necessary). Check out the official Matt Hatter website here for more details, updates, etc. It’s gonna be a BIG year for Matt Hatter, with tons of associated product in the pipeline. Dragons: the hit movie, ‘How To Train Your Dragon’ and its spin-off TV show, ‘Dragons: Riders of Berk/’Dragons: Defenders of Berk’ gets the graphic novel treatment courtesy of Titan Publishing. Six all-new (epic-sized) adventures of Hiccup the Viking, Toothless, Astrid and all the gang, penned by me. Amazon has a listing for the first here (out in May). Marvel Fact-Files: I’ve been contributing to (and continue to do so) Eaglemoss’ all-encompassing Marvel Fact-Files, an in-depth look at Marvel’s entire cast of characters. Numerous and varied entries, but the main one to look out for is the Death’s Head triple card, written by me with new art by Geoff Senior. Hoo-boy! More details here. And in addition to all that, I’m working on a couple of movie scripts, an all-new online project with Geoff Senior (watch out for our Kickstarter promo later in the year) and one of Andrew Wildman and I’s old Wildfur projects, which has been dusted off and is being prepped for a potential animated TV show. Phew. Plus the usual round of conventions, signings, etc. Keep checking back here for details on all of the above and any new stuff that slots in. You are currently browsing the simon furman blog archives for January, 2014.